Excited? That doesn’t begin to express the emotion. After years of planning and months of shooting and editing, my new TV show, Project Smoke, launches on Saturday, June 27 (and in some cities July 4th weekend or later this summer). Our mission: to do for smoking what Primal Grill did for grilling. The 13-week series focuses on traditional and cutting-edge smoking techniques. 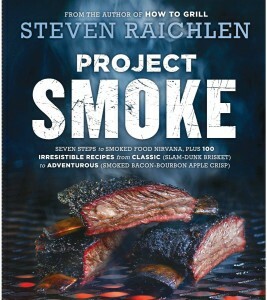 New twists on the iconic smoked foods, such as Texas brisket, Carolina pulled pork, and Scandinavian smoked salmon. Dishes you would never dream you could smoke, from cocktails to dessert. Each show runs 30 minutes. So what makes Project Smoke different than my previous shows? Epic food: The traditional smoked foods you hunger for, like smoke-roasted prime rib, Jamaican jerk chicken, barbecued pork belly, kippered salmon, smokehouse ham, and made-from-scratch bacon and pastrami. Plus dishes that redefine your notion of smoking, from smoky Manhattans to smoked cheesecake. A stunning new location: in Arizona’s Sonoran Desert, where we brought in smokers from around North America and recipes from around the world. A new ethic: with a strong emphasis on grass-fed beef, heritage pork, organic poultry and produce, and wild seafood. We believe that what your food eats and how it’s raised matters as much as how it’s smoked. 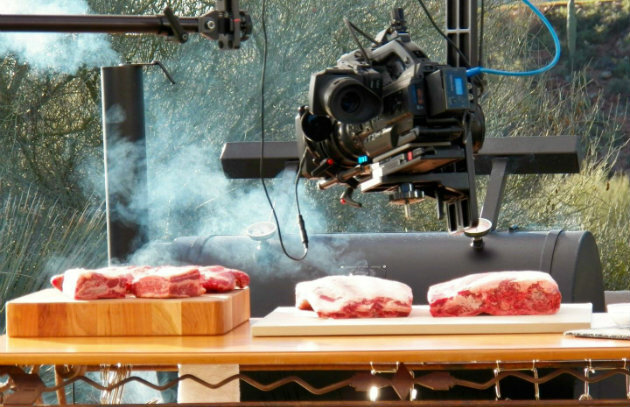 Unique behind-the-scenes footage in each episode—from our field kitchen to the control room—to show you how we put Steven Raichlen’s Project Smoke together. To find out when the series will air in your area, contact your local station or visit the PBS Station Finder. And now we need YOUR help. Please tell your friends and family about Project Smoke. Contact your local PBS station and if they haven’t already scheduled the show, urge them to carry it. Steven Raichlen’s Project Smoke is a production of Maryland Public Television in association with Barbacoa, Inc. and Resolution Pictures, and is distributed by American Public Television. Click here for more about the first three episodes.